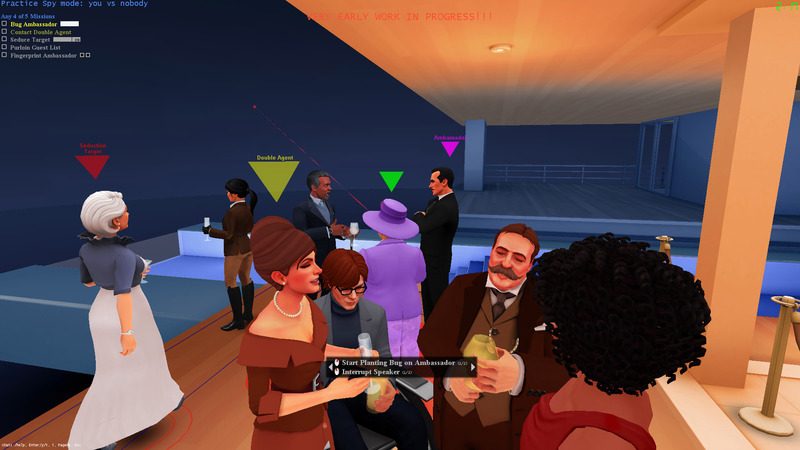 A competitive game of subtle espionage at an exclusive cocktail party. Latest News: spyparty.com to Steam Account Linking Enabled!!! Buy SpyParty on Steam! or Buy SpyParty Right Here! Sign up for the beta to start playing SpyParty immediately! You'll get all the updates, the Steam version of course, and the final version when it's done! Please double-check your email address! A confirmation mail will be sent from noreply@spyparty.com. Let's keep this simple and in plain language, both for sanity's sake and because I can't afford to hire a lawyer: you are paying to access the SpyParty Early-Access Beta, and if and when I ship the complete game, you'll get a copy of that too, at least on PC, but maybe on other platforms if I can make that happen. You'll get any updates during the beta as well, of course. I can ban you from online play if you act like a jerk. And, since this is unfinished software, it might run perfectly, it might have minor bugs, it might not work at all on your computer, or it might cause a chain reaction that destroys our planet (please do report bugs in the beta forums!). This is an "as-is" situation, with no promises or warranties. If I get hit by a bus tomorrow or decide to become a florist next week, that's how it goes. 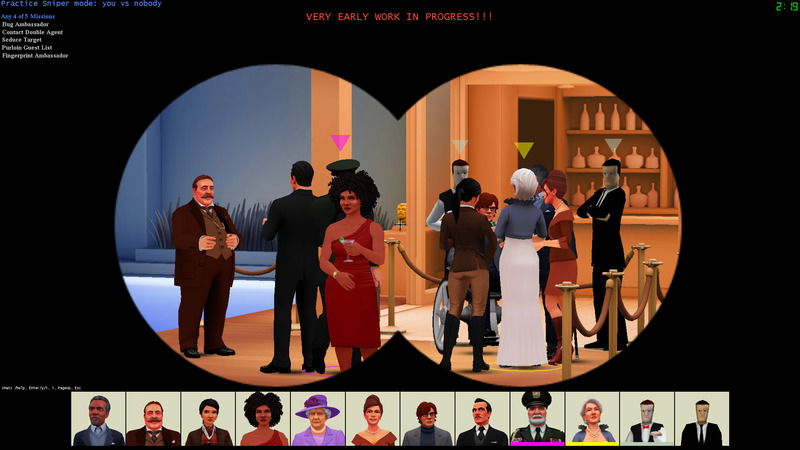 However, I'm pretty careful when I cross the street, and the florist option is unlikely—while I do love flowers, it is incredibly personally important to me that I make SpyParty a deep and wonderful video game, and that you love playing it. Thanks for signing up. It's hard to express in words how much your support means to me. 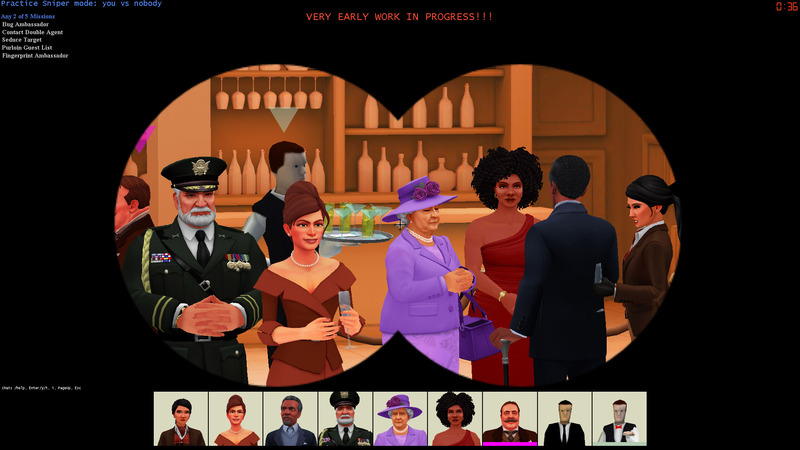 SpyParty is a tense competitive spy game set at a high society party. It's about subtle behavior, perception, and deception, instead of guns, car chases, and explosions. 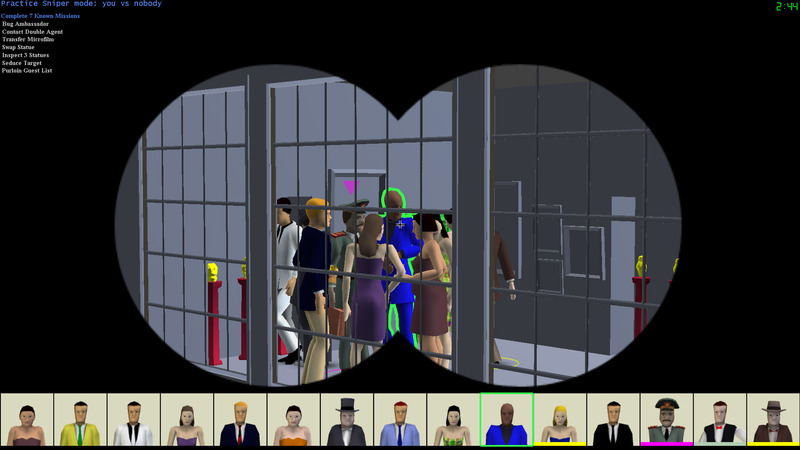 One player is the Spy, trying to accomplish missions while blending into the crowd. The other player is the Sniper, who has one bullet with which to find and terminate the Spy! 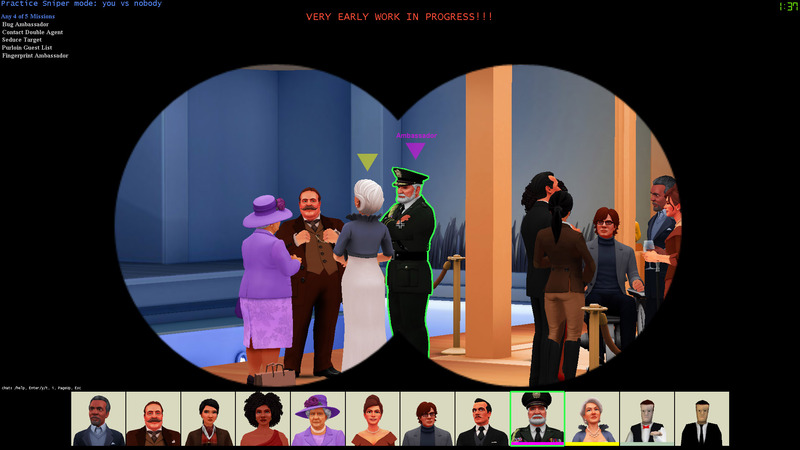 SpyParty is in Early-Access Beta right now, which means you can buy and play the game immediately, you'll get all the updates during development, and then you'll get the final version when it ships. The beta community is friendly and welcomes new players, and there's a private beta forum where players share strategies. As you can see from these screenshots, we're in the process of replacing the older prototype art with shiny new art. You can see more of the new art here and here. If you're already in the beta, click here to log in! There are lots of Let's Plays on YouTube, and if you like watching live streams (you should, they're awesome! ), then the SpyParty Streams Notifier is for you. You can also read the manual, watch the intro tutorial video, or check out the player-created wiki. If you decide to join the beta, you'll get access to the private beta forums, which are chock full of information about playing the game, covering everything from learning to elite play. Tell me about the beta community! 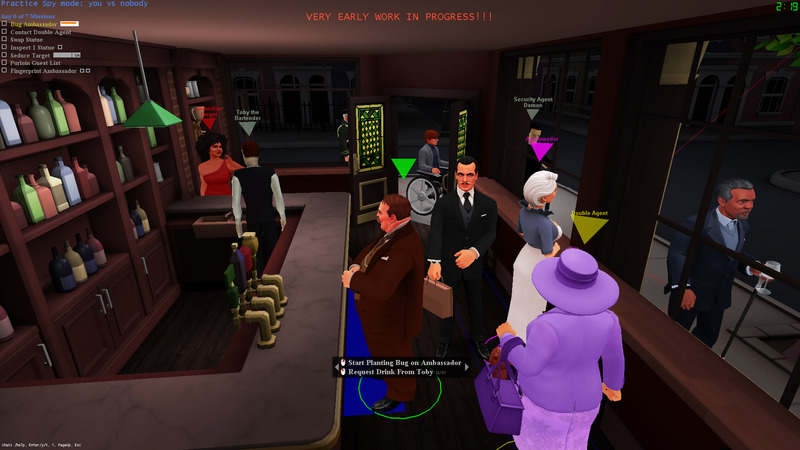 I'm biased, but the SpyParty beta community is the best multiplayer game community I've ever seen. 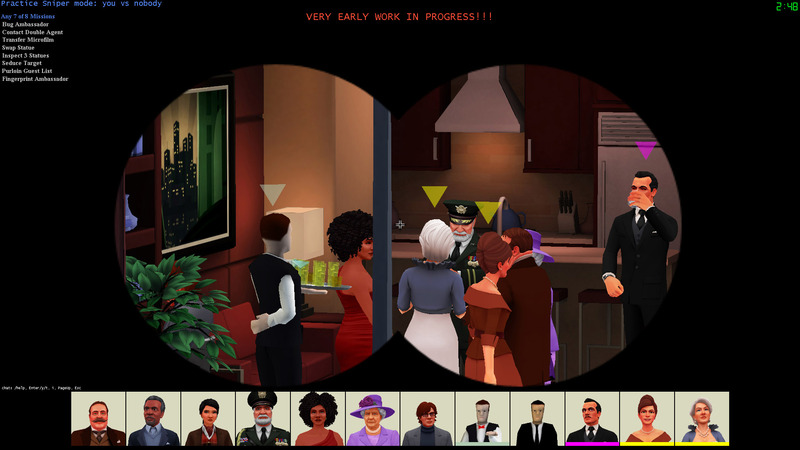 SpyParty is an intensely competitive game with a very steep skill curve, characteristics which seem to make online game communities harsh and unwelcoming, but the SpyParty community is the opposite! They're welcoming to new players, the elite players share strategies with each other in the beta forums and the lobby, and more experienced players often mentor less experienced players to help them get better. The community is also diverse and inclusive, and toxic behavior is not tolerated. The SpyParty community has proven it's possible to be incredibly competitive without toxicity. You can read this blog post which contains my thoughts along with a forum post by one of the beta players, to see how we discuss and value community diversity. The community is small but active, and depending on when you log into the lobby, you can usually get a game anywhere from immediately to within a couple minutes. 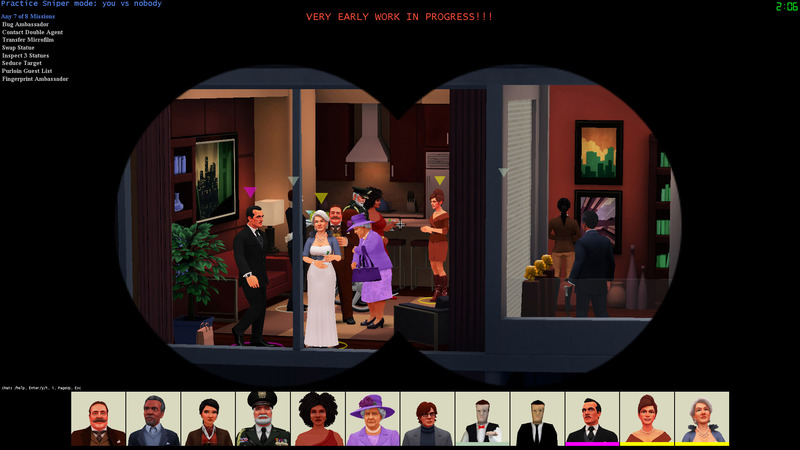 "There has never been a videogame like SpyParty. 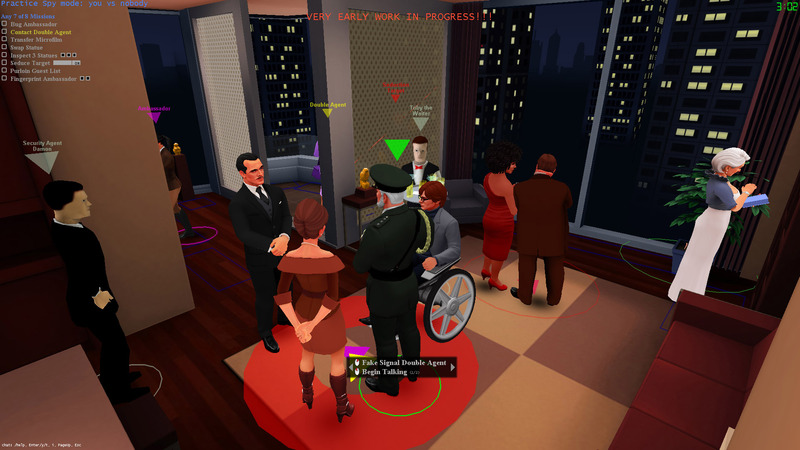 ... SpyParty is as cerebral and personal experience as I've ever had with a multiplayer game. ... Despite being two years away from completion, the early version I saw still remains one of the most subtle, enjoyable, and surprisingly playful multiplayer games I've yet played." "SpyParty is like nothing else I've ever played. ... When the laser focuses on you, the tension is intense. And the relief, when the beam swings away, is powerful." 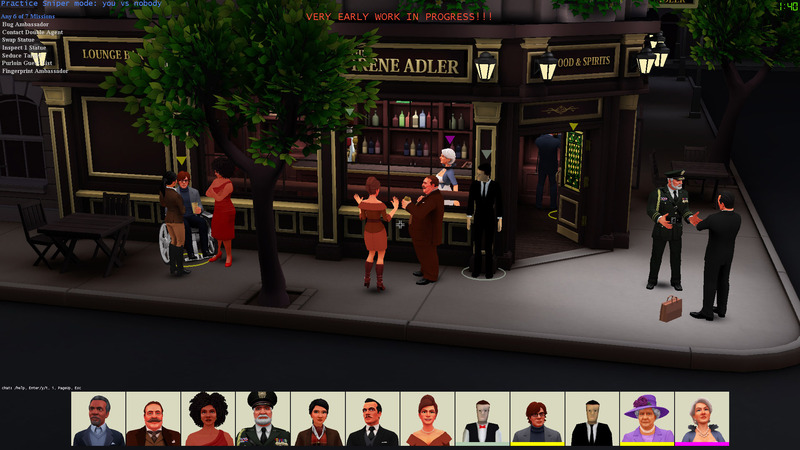 "Part of what is so exciting about Spy Party is the stuff that happens around the game. Hecker has seen the game trigger strong emotional responses. I even felt it... guilt of all things. I've killed thousands — millions? — of enemy characters and even some friendly characters in video games with none of the pangs of consequence. 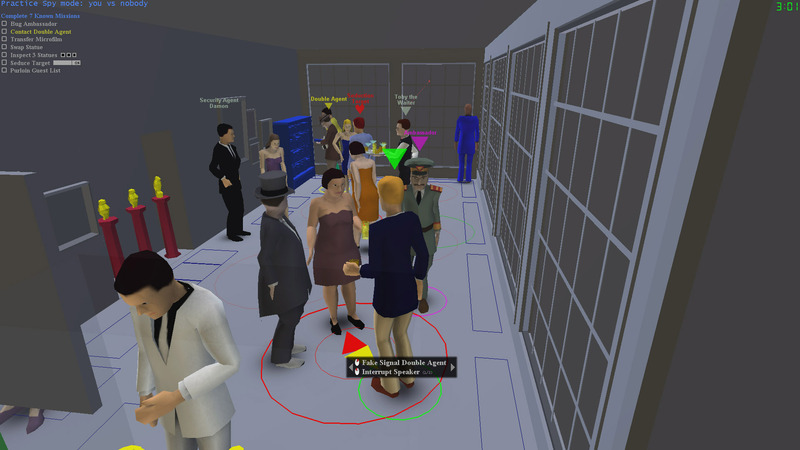 I shot one innocent partygoer in Spy Party after tracking them for a few minutes, after being sure they were Chris Hecker's avatar and up to no good, and then, as they lay dead on the floor I realized I was wrong. I felt bad." Find many more press quotes and links here! When's SpyParty going to be done? I don't know, but not for a while. We have a lot of new art to create, and there are many more maps and missions to program, and tons of other cool features. We're just going to keep making it better, and if you'd like to come along for the ride, join the beta above! I'm going to put my todo list up here on the public site soon, so you can see the development roadmap. Which platforms does the beta run on, and which will it ship on? The beta is a Windows executable, but it runs great on MacOS using the free Wineskin wrapper. A lot of beta testers play on MacOS, in fact, and there's a easy-to-follow tutorial in the private beta forums on how to set it up. For ship, I hope it'll (eventually) be on everything: computers, consoles, tablets, whatever makes sense. It'll be on Steam and other distribution sites as well. I'm not sure if I'll put it on Steam Early-Access yet, but maybe. Check out the full FAQ here! We're a tiny team! I'm Chris Hecker (checker, in-game), and I do the programming, design, biz, and the old crappy prototype art, and John Cimino (ciminator) is doing the new amazing final art. We also have Keith Millot (zerotka) helping out with community, blog, and video stuff. 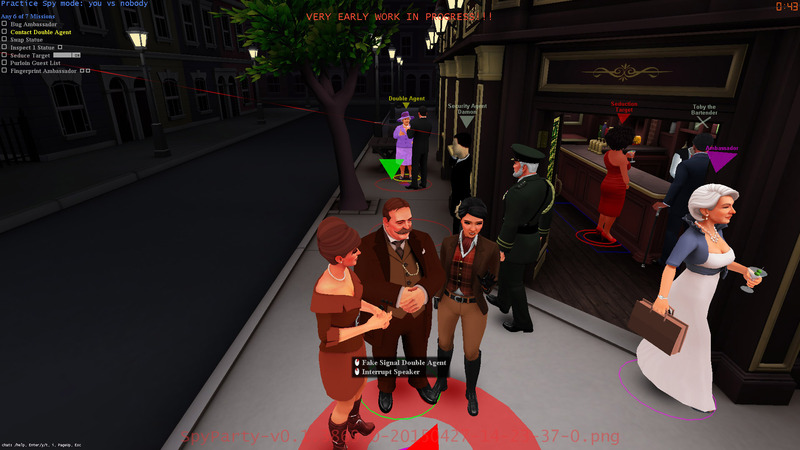 The community also plays a huge part in the development of SpyParty, with new map and mission ideas, tuning recommendations, and of course bugs. The Suggestions Thread in the private beta forums is 165 pages long at the time I'm writing this, and that doesn't include the missions and maps suggestion threads! Wait, where are your laurels? 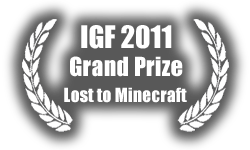 I thought all indie games had to have laurels on their web pages? Huge thanks to Chris Remo for helping me wrestle with HTML+CSS! The successes are his, the failures, mine. If you see a problem on your internet viewing device, please post a comment here.